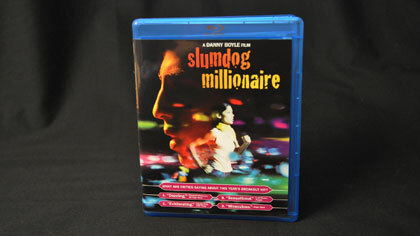 Slumdog Millionaire doesn’t seem like the type of film that would be enjoyable. A tale of loss, struggle, corruption, crime and overcoming, Slumdog manages to be hip, funny, fast paced, and full of enjoyable performances that are never too stuffy. All too often “it” film’s are unfairly voted for Oscar gold, and Slumdog was certainly an “it” film. Fortunately though, it deserved to be. Mumbai, 2006. Jamal Malik is one question away from winning 20 million rupees. How did he do it? Rags to riches stories are meant to be motivational, uplifting, and reassuring. Slumdog Millionaire is all of those things, but with rich, dark texture and a sleek, oddly hip attitude, and a sweet romance at its core. “What the hell can a slumdog possible know?” (00:06:11) “I knew… the answers.” And with that we begin a fascinating exploration of Jamal’s life as a slumdog starting with him as a boy. A lot of what Jamal experiences is heartbreaking, one or two scenes almost unwatchable due to their extreme sadist nature. But there’s always a feeling of hope in the film, and it’s this balance that keeps things tense yet enjoyable. Jamal’s undying love for Latika is the final ingredient in a wonderful film worthy of Oscar gold. 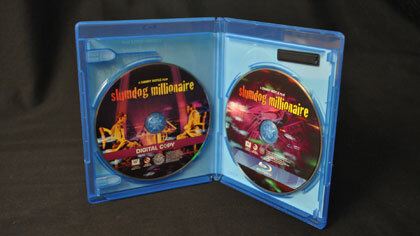 Slumdog Millionaire offers an ultra sharp presentation, with details and colors grabbing your attention regularly. Since the movie was shot using different cameras, grain is visible in varying degrees depending on the scene, and should not be noted as a criticism but thought of as a stylistic choice. Compression artifacts are noticeable occasionally, especially in darker scenes such as the Who Want to be a Millionaire segments. The film takes us to some wonderfully awful locations that are made even more unsettling on Blu-ray. Having first seen the film on standard DVD, I was pleasantly surprised how much of a difference the Blu-ray makes, most noticeable on epic wide shots (00:50:39). It should be noted that the slums are not portrayed in a dull manner. Colors are ultra vibrant, there is texture everywhere, and there are always people filling a shot. These slums are very much alive on Blu-ray. When Slumdog is loud, it’s loud without apology (00:06:44).The film makes excellent use of the rear channels, giving them equal work as the front channels in many scenes. It’s an active surround mix that makes a great movie even greater. Most surprising is the film’s pumpin’ soundtrack, check out (00:35:07) for an example of my surprise. I really love this element of the film. The movie’s lesson is that dark, depressing subject matter doesn’t always have to be accompanied by dark, depressing music. The soundtrack choices reflect Jamal’s unflinching determination and overall positive attitude, the very thing that makes the movie so unforgettable. I was late seeing Slumdog, post-Oscars, and I really wanted to dislike the film for being trendy and talked about. When I finally sat down to watch it the resistance remained. It wasn’t until the scenes with Jamal as a boy that I began to care about the characters, and by the final scenes I absolutely loved this movie. What should be a depressing Academy Away babe is actually a very fun rags-to-riches love story with style and attitude, and is one of the best films I’ve seen in years. You will leave the television with a smile. 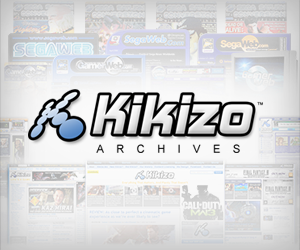 Read More About... Blog, Bollywood.